On Thursday 25 January, the CSCAP EU Committee convened for its fifth annual meeting in Brussels. 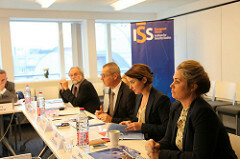 The Committee held a workshop on arms exports, defence markets, and new dynamics in EU-Asia relations. China is increasingly engaged in a combination of investments and infrastructure development, forum-building and political messaging around the world with various sub-regional groupings of countries. Could this potentially challenge the role of the EU in Europe in the long term? The EU and China have long sought to cooperate in and with Africa. Illegal migration to Europe, China’s growing commercial investments and terrorists looking for safe haven in Africa bind European, Chinese and African interests. The proliferation of these challenges beyond African borders is now driving the three parties closer together. Since lifting its historic ban on arms exports in April 2014, Japan has faced an obstacle-ridden path in becoming an arms exporter. This Alert explores the track record of transfers of Japanese military equipment in the past 18 months, and how the transfers contribute to Tokyo’s strategic ambition of becoming a fully-fledged security actor in the region, even at the expense of economic benefits.